Lawford Howard Fry (c1876-1948), railway engineer. No. I : The Engineer 1910/03/25. No. II: The Engineer 1910/04/01. Few locomotive engineers had broader or more international training and experience than had Mr. Lawford Howard Fry, the late director of the Steam Locomotive Research Institute, Inc., New York, whose death occurred at the Mount Vernon Hospital, Mount Vernon, New York, on Saturday, July 10th, in his seventy-fifth year. His home was at 15, Wales Place, Mount Vernon. Only ten days before his death Mr. Lawford Fry had retired from his post as director of the Steam Locomotive Research Institute, to which he was appointed on July 1, 1943. Lawford Howard Fry was the son of a railway executive officer, the late Mr. C. Howard Fry, and he was born in 1873 at Richmond, Quebec. As a boy he came to England and he received his early education at the Bedford Grammar School, which he attended from 1886 to 1889. In the latter year he began a period of shop training at the Ashford Works of the old South-Eastern Railway Company under the late Mr. James M. Sterling (sic), which continued until 1892. From 1892 to 1897 he continued his technical studies at the City and Guilds Institute, at Gottingen University and at the Hannoveriche Technische Hochschule. On the completion of his training he joined the staff of the Baldwin Locomotive Company, of Philadelphia, and for some time was in the workshops as an assistant to Mr. S. M. Vauclain, Jnr. In 1904 he was appointed to the sales staff and was test engineer to the company. In 1905 he came to London to take up the position of London and European representative of the Baldwin Company. Besides keeping in touch with the other European offices, his work consisted in the calculation and development of designs proper for locomotives to conform to varied classes of service, and in the investigation of manufacturing processes and the analysis of locomotive tests. He held his London position until 1913. He was a member of the Institution of Civil Engineers and of the Institution of Locomotive Engineers in London. A good picture of the locomotive position of those years is given in his paper to the Institution of Locomotive Engineers on "Modern Locomotive Practice in Europe and America," which he presented just before the 1914-18 war. 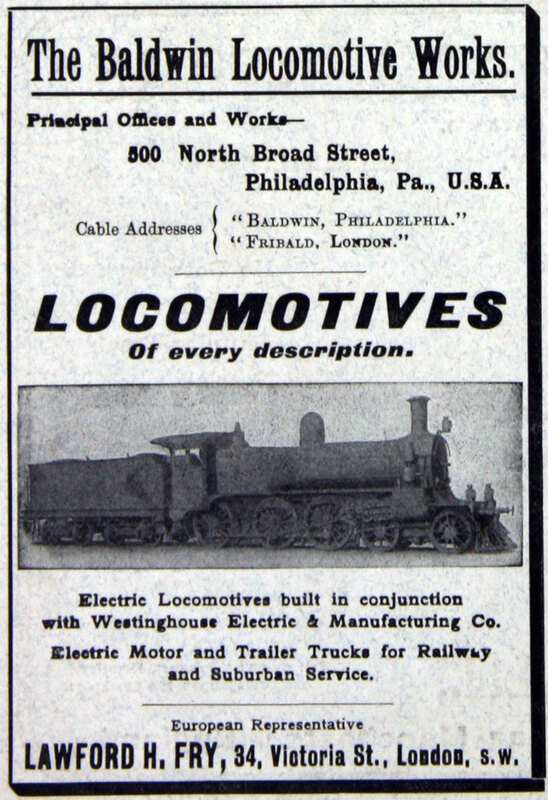 In 1913 he returned to America, to become the head of the metallurgical department of the Standard Steel Works at Burnham, Philadelphia, one of the subsidiary concerns of the Baldwin Locomotive Company. He remained with the Standard Steel Company until 1930 as its metallurgical engineer. About 1929 he assumed American nationality, and in 1930 he was appointed railway engineer to the Edgewater Steel Company of Pittsburgh at its Oakmont factory. This firm specialises in the manufacture of locomotive wheels, tyres and springs. In all the years Lawford Fry was engaged on metallurgical work he did not forget the steam locomotive, and he was a member of American locomotive and metallurgical committees. He was a member of the American Society of Mechanical Engineers, and served on its Council. In 1938 he was awarded the Worcester Reed Warner Medal for "Written Contributions relating to Improved Locomotive Design Equipment." He was also a member of the American Society for Testing Materials and was on its Executive Committee. In 1928 he gave a paper before the Institution of Mechanical Engineers on " Experiences with Three-Cylinder Compound Locomotives," and was awarded the Bernard Hall Prize. His textbook entitled "A Study of the Locomotive Boiler," which was published in 1924, is widely known and used. He was a valued contributor to our own pages and wrote many technical articles on locomotive design and practice, and metallurgical subjects for both the British and the American technical press. He was keenly interested in the history of the locomotive and was a member of the Newcomen Society. When in 1943 a group of American coal carrying railway companies decided to form the team Locomotive Research Institute at 60, East Forty-Second Street and later at 50, Church Street, New York, 7, it was not surprising that Lawford Howard Fry was chosen as its research director, as he had already earned for himself the name of locomotive scientist. He threw himself into that work with all his energy, though his task was made the more difficult by the strain thrown upon locomotive manufacturers and railways alike by the American war effort. Work on locomotive research was accelerated under his personal direction, under the jurisdiction of the Technical Committee of the Institute. The object of that work was to improve the design and performance of the steam locomotive to meet the increasing competition of the diesel locomotive, and later on the gas-turbine locomotive. Recent changes which had already improved the performance of the steam locomotive and doubled the yearly mileage compared with performances a few years earlier were carefully investigated. Early this year Mr Lawford Fry was invited by the Institution of Locomotive Engineers in London to give the next Sir Seymour Biscoe Tritton Lecture, and it was hoped that in that lecture Mr. Lawford Fry would have been able to give some account of his investigations. His death will be deeply mourned by the many friend he made in Great Britain, Europe and America. "LAWFORD HOWARD FRY, whose death occurred in New York on 10th July 1948, was an authority of international repute on railway motive power and was well known to many members of the Institution, to whose discussions he made frequent contributions. He was born in Canada in 1873, but coming to this country at an early age, received his general education at Bedford Grammar School from 1886 to 1890. On the completion of a two years' apprenticeship in the locomotive shops of the South Eastern Railway Company's works at Ashford, Kent, under the late Mr. James Stirling, he obtained his theoretical training at the Central Technical Institute and at the University of Gottingen and the Technische Hochschule at Hanover. In 1897 he went to the United States and after three years' further training at the Baldwin Locomotive Works, Philadelphia, under Mr. S. M. Vauclain, was for the next six years assistant to the latter, being chiefly in charge of testing. He came to London in 1906 as the technical representative in Europe for the Baldwin Company and in the same year was elected a Member of the Institution. Seven years later, however, he returned to America to take charge of the metallurgical department of the Standard Steel Works at Burnham, Pennsylvania, where he remained until 1930. Subsequently he joined the Edgewater Steel Co, of Pittsburg, as railway engineer, an appointment he resigned in 1943 to become director of research at the Steam Locomotive Research Institute in New York, where under his personal and energetic direction work on locomotive research was greatly accelerated and valuable results obtained. Mr. Fry contributed a number of articles to the journals of the engineering institutions of which he was a member, and he presented two papers to the Institution, the first in 1908 on "Combustion and Heat Balances in Locomotives", and the second in 1927 on "Experimental Results from a Three-cylinder Compound Locomotive", for which he was awarded the T. Bernard Hall Prize in the following year. 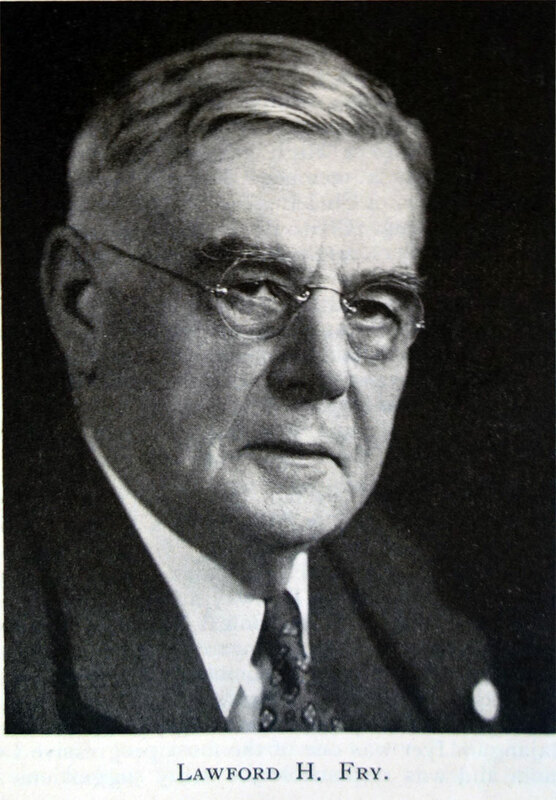 He was a Fellow of the American Society of Mechanical Engineers, which awarded him the Worcester Reed Warner Medal in 1938 for his "contributions relating to improved locomotive design and utilization of better materials in railway equipment". He was also a Member of the Institution of Civil Engineers. His textbook entitled "A Study of the Locomotive Boiler", which was published in 1924, is widely known and used." This page was last edited on 23 May 2016, at 08:00.